If you judge therapy units by their performance, then the Laserex 3000 is bound to be the top of your list for a NON-FDA cleared system. 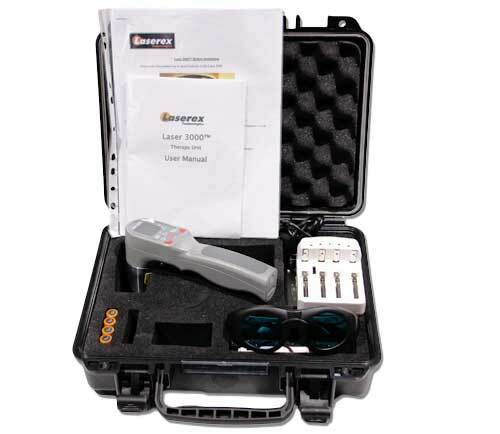 The Laserex Laser 3000 is a class 3b laser specifically created for treating animals including dogs and horses with acute and chronic issues. Its an ergonomically designed portable laser with premium product features like acceptation ease of use and safety. This unit packs good power into a small portable package. Interchangeable Emitter Heads are available with single and multiple lasers. This unit comes standard with one emitter. The emitter head is machined from aluminum. The standard emitter wavelength is 808nm but other wavelengths are available. All Laserex systems sold by ColdLasers.org include a standard US 110 volt battery charger and the laser-therapy.us protocol library. The Laserex Laser 3000 is a lightweight unit weighing only 340g including batteries and measures 205mm, thus making it easy to transport in its stylish carry case. Attention to detail was placed into the design the Laser 3000 in order to obtain a look that was both conventional and classy. The design of the unit is simple, clean and orderly. This is reflected in the entire Laser 3000's product features. The Laser 3000 can operate either off a single head or cluster head from the same base unit. This is very convenient and time saving when treating either large or small muscle groups on the one animal. WE RECOMMEND BUYING THE 450mW HEAD FOR MOST APPLICATIONS. The 300mW single diode head is best for trigger point therapy. The color display of the OLED screen along with soft buttons, easily performs all the functions required to operate the Laser 3000. The Laser 3000 can store up to 14 programmable treatments making it a straight forward and easy procedure to retrieve and execute programs for a variety of standard protocols. The units comes with 2 sets of interchangeable batteries and a charging station. This allows for a full backup set of batteries which is perfect for treating animals on the go. 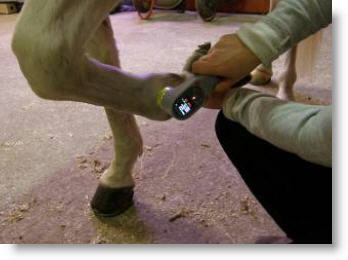 This unit is perfect for busy vets, trainers and animal owners that require a laser therapy device that delivers high performance at an affordable cost. The Laserex 3000 does is like no other cold laser product. This unit is available for home use on animals including companion pets and horses. UPS Ground shipping to anywhere in the US is free (including Alaska and Hawaii).